I hate writing about trends this early in the season. The Dodgers have played eight baseball games. Only one of their starting pitchers has gone more than twice, several have only gone once. Every statistical point in early April needs to be qualified and caveated, and most don’t last. 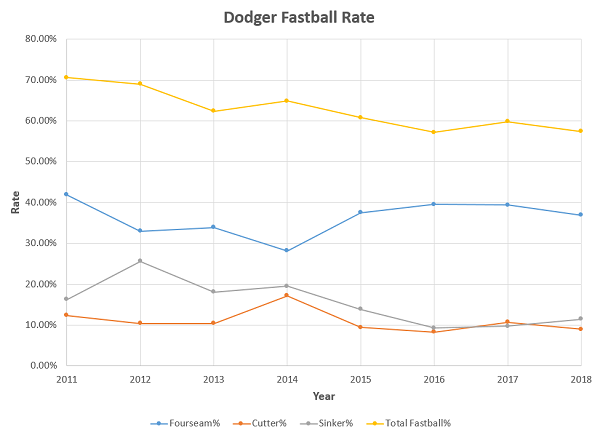 Still, we need stuff to talk about that isn’t Kenley Jansen‘s velocity or the Dodger offense being terrible, so here is an early season statistical point: The Dodgers are throwing fewer fastballs as a team, at least so far. You will notice an overall trend, one which has continued this year. 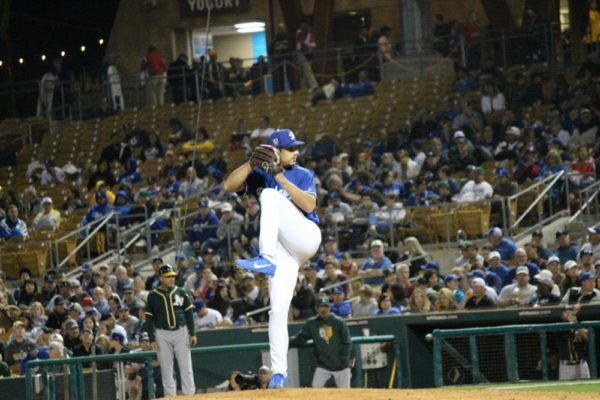 So far the 2018 fastball rate is not lower than 2016, but the team’s fastball rate is 6th-lowest in baseball in this young season. The biggest change so far is the decline in fourseam fastball rate, from 39.4% to 36.9%. 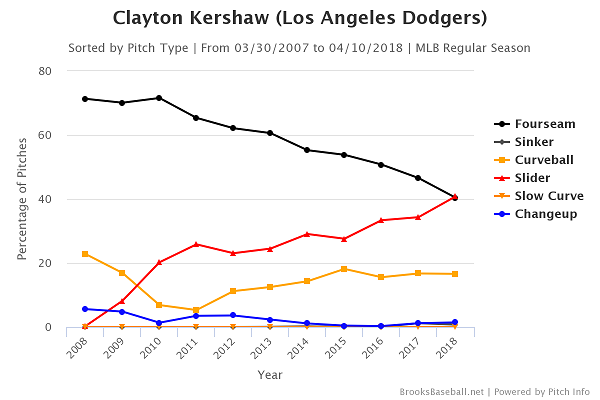 There has also been an increase in twoseam rate and a decrease in cutter rate, likely owing to Kenley Jansen only throwing three times this year. It’s also worth noting that something strange happened in 2014 which might be interesting to study in hindsight. There has been a lot of talk about how the league is going to throw fewer fastballs as bullpen arms become more interchangeable and starters turn over the lineup fewer times (a fundamentally anti-labor position, but we’ll save my rant on that for another time). However, the league-wide rate has not budged much so far this year. In 2017, pitchers threw fastballs 61% of the time. In 2018, they’ve thrown fastballs 60.7% of the time. The lack of change might be a “pitchers are still warming up in April” thing, but so far the Dodgers have moved more than the league and are well below league-average again this season. Unfortunately it’s too early to figure out why this is happening. Some of that might just be a disproportionate number of innings in weird places. Kershaw has started three times while several Dodgers have only started once. Three extra-inning games so early in the season moves stuff a lot as well, since the bullpen has pitched a disproportionate number of innings. Perhaps the Dodgers were throwing fewer fastballs to the Giants (5/8 games so far) as a scouting report. 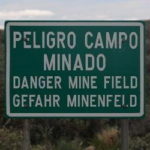 There are too many caveats to list. Unfortunately, this is an unsatisfying conclusion. Statistical posts in April often have unsatisfying conclusions (or at least they should). But it’s something to watch that isn’t “Is Kenley Jansen broken?” and it’s not nearly as dire.